I first had this bread at the Outback restaurant. I was stunned when they told me that it was honey whole wheat bread....hmmmm. Then I had this bread at the Cheesecake Factory. I found a copycat recipe and made some changes by taking out the coffee, reducing the honey and sugar. I saw some recipes that had 25 drops of red, blue food color....YUCK! I did not want that much food coloring in my bread... Cocoa, instant coffee, molasses or carob powder may be substituted, but it won't be as dark as the bread you see here and may lend a bitter taste to the bread. The secret to this dark colored bread is caramel color. You can find it on Amazon:McCormick Food Coloring, Caramel, 16-Ounce or at Orson Gygi, a restaurant supply store in Salt Lake City. Caramel color is NOT a food coloring in the chemical sense; it is simply burnt sugar. Restaurants use caramel color to tint desserts, candy, cakes, cookies, frosting, darken sauces, gravies, soups, marinades, and brush on meats to add more roasted color. Where can you find caramel color? King Arthur sells a powdered caramel which is another option, though I haven't tried it. Outback Bread: Step-by-step instructions with photos! Using caramel color and a touch of cocoa powder is the secret to this dark, sweet, whole wheat bread. Caramel color can be found online or at a restaurant supply store. Vital wheat gluten helps create a soft loaf of bread and is optional. Frida, you rock! This is exactly the site I was looking for... I'm printing these out and trying some recipies soon! I love this bread! I can't wait to try it. Thanks for posting! I am going to try this...it looks wonderful. Can you tell me if substituting 2 TBS of molasses would be all right in place of the caramel color? Kimberly, You can definitely sub molasses for the caramel color ~ although you will get a lighter in color loaf and have a molasses taste, depending on the type of molasses that you use. Others have used cocoa, with the same results. The caramel color has no taste, but contributes to a deep, dark color that is indicative of this bread. Give it a try and let me know how it turns out for you! I've totally got to try this bread if it's anything like Outback's! I'm excited to have found this recipe as my boyfriend loves this bread! Couple questions though....are we supposed to use warm water? I would assume so but the recipe doesn't specify. Also, does this bread really not have to rise at all? Thanks! Anonymous, you have a good eye! 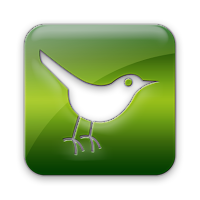 I've removed the recipe from the post, but have kept the links as they are correct. Yes, use warm water (100°-110°) and it will need to rise twice: once in the bowl, and secondly as loaves. Good luck! Hi. Would bread flour work in place of all purpose plus gluten? Yes, absolutely! The added gluten to all purpose flour is the equivalent of bread flour. Hi Ako! Thanks for the note. I added the times for the standard loaf pans to my full page printable recipe. This recipe makes (3) 8x4 loaves (30-35 minutes) or (2) 9x5 loaves (35-40 minutes). Hi Frieda - I'm the lucky lady who won the digital scale. I made this bread this weekend and used the scale - the bread rocked! I'm so proud of myself for tackling this. I thought it would be too hard but it wasn't. Thanks again for the great scale and recipe! Woot! Thanks for the comment ~ it really made my week! I'm thrilled that you are enjoying the scale ... and the bread! I've been thinking about going back into baking, this might be worth trying. I wonder who has the carmel color in Phoenix? I'm impressed that you want to get back into backing during the hottest days of the year, especially in Phoenix! Why does the recipe say to divide it into 8 piles if it only makes 3 mini or 2 standard loaves? This recipe will make 3 mini loaves on a baking sheet or with mini loaf pans. You can divide the dough into 2 piles to make 2 large (9x5) loaves or into 3 piles to make 3 medium (8x4) loaves. The mini loaf version is listed first as it is the size that the outback restaurant makes. Why use the coloring? Just so that it looks like the bread from Outback? Would it still turn out without it? Yes, it is only for the color. Some readers have made this without the color and have told me that it tastes great! My husband and I love this bread! Can't wait to try this recipe, looks yummy! I live in Phoenix and can't find caramel color anywhere. I can order it but then I have to wait and pay $11 bucks for shipping. Has anyone ever found this in Phoenix? If not, here's calling all my AZ readers ~ anyone found success in finding this at a restaurant supply store? Ashley, I would Google restaurant supply stores in your area and call to find this product. Caramel color is not crucial to this recipe; however, we "eat with our eyes" first and the color does make a great impression! the recipe sounds great, but i would definitely skip the caramel color! http://cspinet.org/new/201102161.html supposedly it's made from a byproduct of ammonia & is carcinogenic :( i will def try this out sometime this week & report back! Jasmine, thank you for your comment. I did read the article you linked. 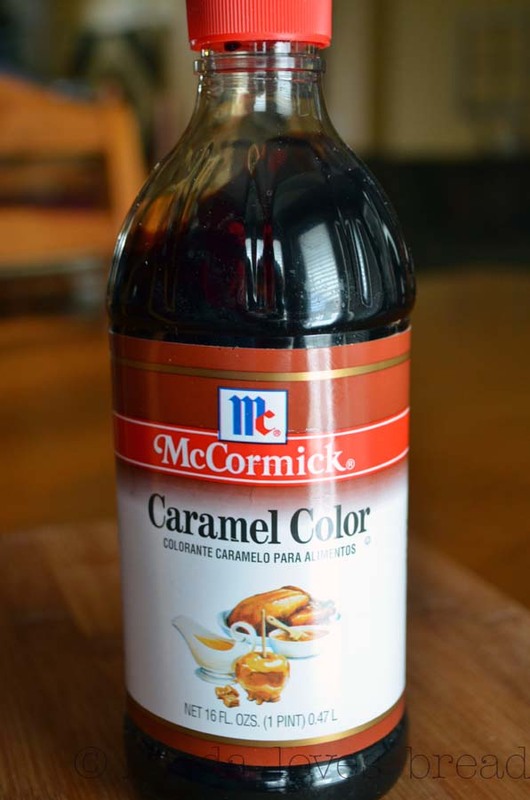 On the bottle of McCormick Caramel Color, the ingredients are simply "caramel color and sulfiting agents." The article states that there are 4 types of caramel color: two made with ammonia and two NOT made with ammonia. It also states the two that are made with ammonia should be banned; the types commonly used in colas and other dark soft drinks. Is McCormick Caramel color made without ammonia? I don't know. The phrase "caramel coloring" can be misleading....does it need to state that it was processed with ammonia? I will definitely write to the company and find some answers! This recipe can be made without the caramel color and will still have a great flavor. I just heard back from the McCormick company via email. They do make the caramel coloring using a "sulfite ammonia process" which puts the caramel color in the class 4 of caramel color. (http://en.wikipedia.org/wiki/Caramel_color). The FDA currently classifies this caramel as "generally recognized as safe" which is open to interpretation. It is amazing to see how many store bought products have caramel color in them! The article you linked to is dated Feb 2011 and I tried to find more current research on the safety of using this product, but haven't found any. If you know of any current research that is backed up with data, please send them along. Thanks! Will this work in a bread machine? What setting? Emily, this will work on a wheat bread setting in your bread machine. Depending on the size of your machine you may need to cut this recipe in half or in thirds. The recipe will make 3 one pound loaves or two large 1.5 pound loaves. If you want to have the corn meal crust, use the dough only setting, shape and bake in your oven. Can you tell me where you found it and what brand it is? :D I agree, it would seem pointless! The recipe calls for 2 T. of caramel color; however I am not sure how concentrated this particular brand of caramel color is. Try it out on a 1/2 batch recipe and let me know how it works for you! :) I see each and every comment in my email before it is posted onto my blog. Thank you and enjoy your holidays! Is the caramel extract the same as caramel color? I have checked 4 stores & that is all I find. No, it is not the same. Extract is for flavor only. If you want this bread to have the characteristic dark color, you will need to find and purchase caramel color online. You can make this bread without caramel color and it will taste great; however it will not be a dark color. Some recipes use rye flour and molasses to achieve the dark color, but it will not taste like the bread you find at the restaurant. Can't wait to try this one. I did try one of the other recipes that called for tons of food coloring. Thank you for another option. hello there and thanks to your info – I have certainly picked up something new from proper here. wow! FINALLY...every time i find recipes for this type of bread, they are adding coffee or some other flavor altering ingredient that I KNOW cannot really be in the bread at the restaurant's! i can't wait to try this! Yep, coffee, 20+ drops of food coloring, rye, molasses, etc. The waitress told me that this bread is "Honey Whole Wheat," and that is what this bread is. Enjoy! I have the Carmel color from King Auther. I was curious if you use the same amount for Carmel color when usingthe powdered version vs. the liquid version? I just checked the King Arthur Flour site and their recommendation is to use 1-2 Tablespoons, but it doesn't specify for how many loaves. I looked up on of KAF's recipes and this one (http://www.kingarthurflour.com/recipes/dark-pumpernickel-onion-loaf-recipe) has 1 T. for 3 cups total flour, which is about what I have. I would suggest 2 T. for this recipe. Give it a try and let me know how it worked for you! 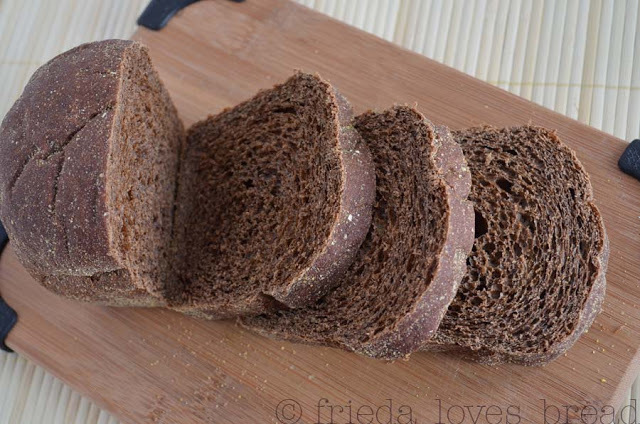 Can't wait to make this bread, it looks wonderful, such a deep colour. Just be looking at the pictures I can imagine smelling the fresh bread. Yummie! Hi Frida, I read through all the comments here and didn't find an answer to my question. I apologize for asking such a silly question, I'm clearly a bread newb. Is "wheat flour" the same as "whole wheat" flour? I have whole wheat flour as well as bread flour (white in color). Congratulations on such a popular and successful recipe. I'm hoping to try it out this week. Bianca, I'm happy to answer any question! Yes, wheat flour is the same as whole wheat flour. Bread flour is all purpose white flour with a higher protein and/or gluten content. You can use both of the flours you listed in your comments with this recipe. Enjoy! I just made this bread today..I halved the recipe though....The caramel color does not seem to be available here in QC Canada..so I followed the recipe exactly but added 1 tbsp of molasses. and a tsp of instant espresso granules...and ..I used 1/2 unbleached all purpose flour and 1/2 Robin Hood bread (grain) flour. Also..I just put everything in the bread machine on the dough cycle..removed..put in my small and medium loaf pans..let rise..and the baked.. Wonderful! Loved your adaptations and thanks for letting my readers know that you can make this in your bread machine. I agree, honey butter would be soooo good with it! 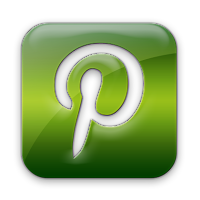 Thank you for asking permission ~ You are welcome to post the original recipe link to my blog. If you google it you can find some more suggestions for this. Probably best to avoid ingesting carcinogens, especially since they seem so hard for so many people to track down in the first place. It is my understanding that while McCormick's caramel color uses the ammonia sulfite process, and according to Wikipedia,it is not classified as a carcinogenic (http://en.wikipedia.org/wiki/Caramel_color). 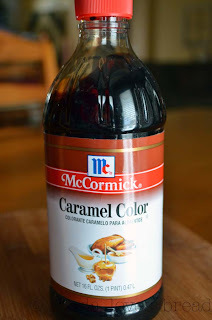 I have tried making my own caramel color, using the recipe you provided above, setting the smoke alarm off several times, and cannot get it as dark in color as the McCormick coloring. Several of my readers have made this recipe without the caramel color and have found it enjoyable, although light in color.